In March, the DPW mowed the entire flat basin. This annual operation controls the residual invasive plants, encourages native growths and prepares the ground for seeding and planting in June at the southern end where Miscanthus, a highly invasive mono-cultural silvery grass had proliferated. Seeding and planting of other areas will follow this autumn and in 2019. After the decisive actions taken in the Spring and Summer of 2017 to eradicate the invasive vegetation in the 12+ acre flat basin, transformation work take a recess as winter sets in. But the hardy Deviners are continuing their weekend task of freeing the trees from strangling vines. They are also clearing field stones from the flat basin to prepare it for mowing by the DPW in March next year. The mowing will further weaken any residual invasive shrubs and weeds. Weather permitting, in June 2018, we will be doing Phase 1 seeding and planting of the native meadow. We will post more details closer to time. + October 2017 Race Track Nature Preserve transformation highlights. +Native meadows in our own gardens! On Saturday September 30, Penn Marchael, Native Meadow Expert from Larry Weaner Landscape Associates spoke to residents about creating native meadow landscapes in our home gardens — as driveway borders, as garden accents, and in combination with turf/lawn. Native meadow flowers and grasses are beautiful and ecologically positive: they provide an excellent habitat for wildlife, and absorb storm water to prevent soil erosion and run-off of fertilizers and other nutrients into our drinking water. They are also low-maintenance/cost-effective: meadow plants, once established in year two, need only once-a-year mowing in March, compared to weekly mowing of lawns. A progress report on the Race Track Nature Preserve was also given by the Tree Advisory Board. Click the following to hear a recording of the presentation in it’s entirety. + Our first summer volunteer deployed at the Race Track Nature Preserve. Read more. 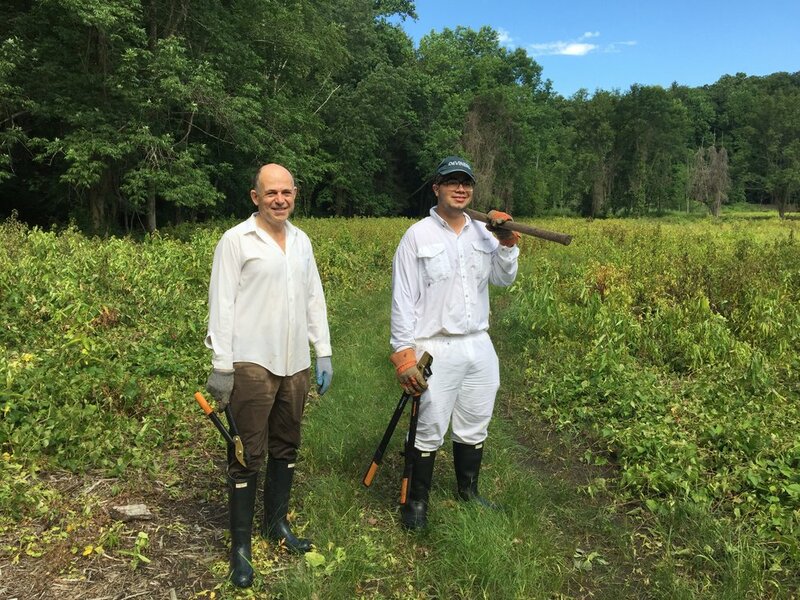 Felix Sanchez, son of Race Track Nature Preserve Founding Stewards Maria Nunes and Peter Hempel, volunteered to work with the Tree Advisory Board for the month of July. His many assigned tasks included helping Tree Advisory Board member Christopher Gow to create new paths that connect the pre-existing circular trail with the new north entrance to the Preserve. He hand-pulled the highly invasive mile-a-minute, Japanese stiltgrass and garlic mustard at the embankments. He cleared some rocks from the basin of the Preserve to prepare it for the eventual seasonal mowing. He watered the shrubs we planted at the southern end of Tuxedo Lake (for the purpose of establishing a denser vegetative buffer against storm water run-off that carries nutrients into our drinking water and aggravates the spread of milfoil). Felix also developed a Google Drive document to house important data that have informed the work of the Tree Advisory Board (e.g., environmental and engineering studies of the Preserve, flora and fauna lists, etc.) and to maintain a historical record of our work (e.g., our meeting agendas and minutes, presentations to the BOT, etc.) Thank you, Felix! June 2017 update on work at the Race Track Nature Preserve. Read more here. May 2017 Native plants and wildlife return after removal of the invasive vegetation. March 2017 Tackling the invasive plants. Read more here.